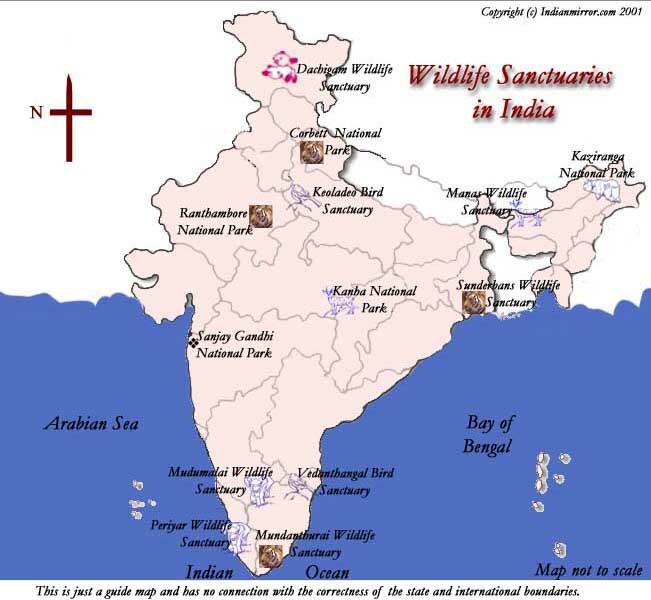 Most of the sanctuaries provide well are at least optimum accommodation and other facilities but they had to be booked in advance. Some parks even provide modern guest houses. Usually van and jeep rides and also boat trips are arranged to give the visitors a good view of the animals in their natural habitats. Watchtowers and hides are also available. This is situated around 35kms to the south of Chengalpattu in Tamilnadu and is home for a large variety of birds. Cormorants, egrets, herons, storks, ibises, pelicans, grebes and hornbills breed here from October to March. At the peak season of December to January more than 30, 000 birds can be spotted. This one also known as Koddikarai is situated in Tamilnadu, around 90 kms from Tanjore. This is a wetland area jutting out of the Palk Strait that separates India and Sri Lanka. It is famous for flocks of migratory birds mainly flamingoes. Black bucks, spotted deers and wild pigs are found here. Time to visit: November to January. This is located in Tamilnadu along its border with Kerala. It mainly consists of tigers but also has chitals, sambhars and lion tailed macaques. But it is extremely difficult to spot the tigers. Best time to visit is between January and March. This is along the slopes of the western ghat mountains in the border between Tamilnadu and Kerala. It is also known as Indira Gandhi Wildlife Sanctuary. It has an area of around 1000 sq Km and houses elephants, gaurs, tigers, panthers, deers, boars, porcupines and wild cats. In its heart lies the Parambiculam Dam, which is of good scenic beauty. The best time to visit this is between February and June.